As Challenge Coins continue to increase in popularity, few do so quite as much as USMC Challenge Coins. 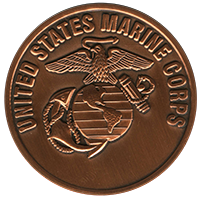 Marine units across the world have their specific, customized challenge coins and carry them proudly. Let us help you make yours! 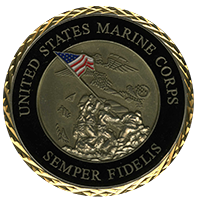 Our specially made custom USMC challenge coins are of our highest quality, and can be made to fit all tastes and budgets. Our process is pretty simple. We offer a variety of options, including special shapes, graphic design, personalized messages, and your choice of plating. We will look at the graphics and specs you would like to incorporate in your USMC challenge coins. Then, our graphic artists will get to work making your design into a reality. We’ll incorporate your input on the final product and begin production of your coins in a timely manner. Throughout the process, we’ll be sure to keep your budget in mind to make sure that your challenge coins don’t break it. We’ll keep you informed of any price changes BEFORE you order! Our coins and medals are meant to be cherished for a lifetime. They are designed to last through the ages and even to be passed down from one generation to the next. When you design and create your custom coins, you are making an investment in a long lasting commemoration of service. Founded by a decorated Veteran, Noble Medals is dedicated to seeing that your coins are high-quality and that our service to you strives to match your service to the country. We value the opportunity to serve and honor veterans in the USMC and other military branches. We believe that the work we do now creating USMC challenge coins should mirror our appreciation of those for whom they’re made.